International shipments available immediately with in 3-8 days to Europe and max 7-15 else where. Shipping costs are 18% to all countries. You may get faster delivery for outside Europe at Amazon.com or Amazon.de. Finland: Shipments via our store start on Feb 25th to Finland, delivery time 2-3 working days or book a collect time at our office in Helsinki, Mannerheiminaukio 1 A. The book is also available in some Finnish online book stores and can be requested to "offline" bookstores, too. Want to order more than 10? Leave your phone number at the checkout in case we need to verify your order and calculate the real shipping costs and exact delivery time. 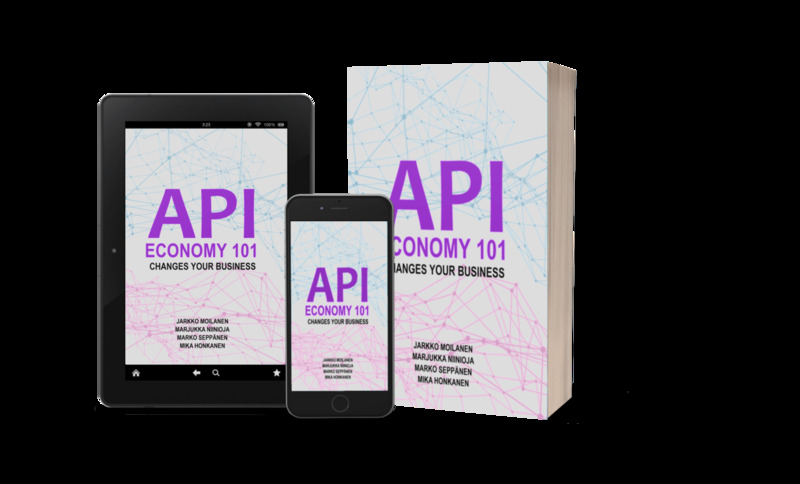 E-book is published in 03/2019, but you can already order a 50 page preview, which you can access directly, see the API Economy 101 e-book preview -product. Looking for the Finnish edition, API-talous 101? API is technology and digital product used for artificial intelligence, platform economy, and internet. It has the capability to change business models dramatically. APIs (application programming interfaces) are becoming a major competitive factor for companies. This book takes on the fundamental questions of API Economy and approaches the subject pragmatically and clearly without technical jargon. The book clarifies the birth and shape of the API Economy with numerous practical examples. This is the first API Economy book based on scientific references. Originally this popular book was written in Finnish. It is a great start for students and advanced professionals alike. After reading this book, you will understand what it is all about and how to move forward and grow your business with APIs. The authors are leading Finnish API-experts with an abundance of experience from API and platform economy as authors, researchers, and lecturers and consultants. Course material is available at www.apieconomy.info and a lean business oriented method for creating APIs at www.apiopscycles.com.